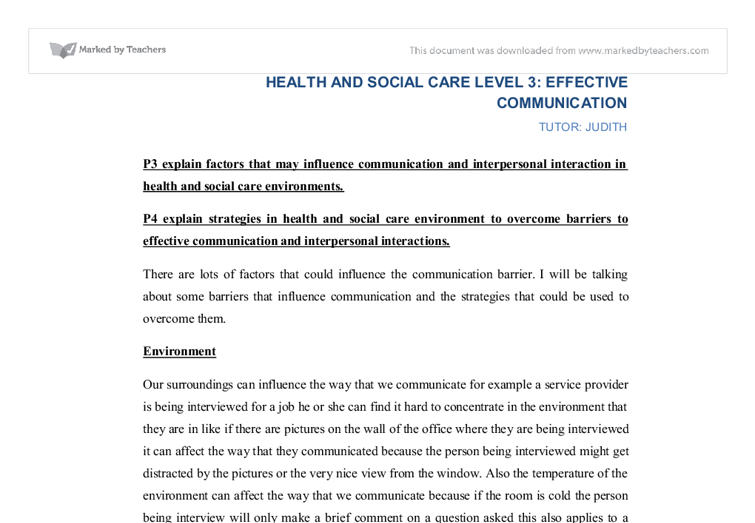 P3 explain factors that may influence communication and interpersonal interaction in health and social care environments. P4 explain strategies in health and social care environment to overcome barriers to effective communication and interpersonal interactions. There are lots of factors that could influence the communication barrier. I will be talking about some barriers that influence communication and the strategies that could be used to overcome them. Environment Our surroundings can influence the way that we communicate for example a service provider is being interviewed for a job he or she can find it hard to concentrate in the environment that they are in like if there are pictures on the wall of the office where they are being interviewed it can affect the way that they communicated because the person being interviewed might get distracted by the pictures or the very nice view from the window. Also the temperature of the environment can affect the way that we communicate because if the room is cold the person being interview will only make a brief comment on a question asked this also applies to a service user in addition the background sounds can affect the way that we communicate, if there is music play the service user or the person being interview might sing along instead of listening to what is being said. Strategies There are different ways to overcome the barrier in communication when in an environment that could distract you. For example when giving and interview that room in which the interview will held should not contain anything that could distract the person being interviewed and the temperature of the room should be fairly warm not too cold or hot. ...read more. When doing an activity with the resident it will be effective for them to communicate with the group that they are in so the show be sitting in groups around a table in a way that they can look at each other and communicate effectively when communicating with each other this will give them an opportunity to talk and have conversations between themselves. Noise Noise can influence the way that we communicate with each other in a care home a service user can be side tracked when there is a background sound when they are telling you something or complaining about a pain that they may have. For example when talking to someone a room where there is music playing it will be very hard for them to hear what you are saying so you would have to shout for them to hear you and if it is a private conversation it is possible that everyone will hear the conversation that you are try to have or that the conversation can be misinterpreted and misunderstood. Strategies There are different ways that the barrier of noise can be broken to improve the way that we communicate. When in a room where there is a loud noise and a service user is trying to communicate with a staff and is trying to have a private conversation there should be a change of since where the staffs takes the service provider in to a room where there is no music to talk to them this will be and effective way of communicating where there is noise. ...read more. to listen for meaning in what they are trying to tell them to find the real problem in what they are saying. Also when a resident is talking to service provider the service provider should turn their full attention to what the resident is trying to say by doing this it give them a chance to listen carefully to what the residents are saying this should be done by slowing down on tasks that the service provider is doing and focusing on the resident, what she is saying and doing and communicating. There are different ways to overcome the barrier in communication when in an environment that could distract you. For example when giving and interview that room in which the interview will held should not contain anything that could distract the person being interviewed and the temperature of the room should be fairly warm not too cold or hot. When talking to a resident or a service user they should be taken into a room where they is nothing to distract them however sometime s the environment that we are in can have an effective way of communication for example when a staff is in a service users room and does not know what to talk about they could start by asking a question about some of the picture in the service users room. Things that we can see in our surroundings can help the service users start a conversation with the service providers. However there are strengths and weaknesses to this strategy because not all the service user would like to ?? ?? ?? ?? 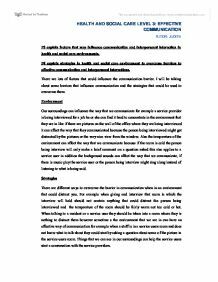 HEALTH AND SOCIAL CARE LEVEL 3: EFFECTIVE COMMUNICATION TUTOR: JUDITH ...read more. make generalisations). The use of stereotypes is a major way in which we simplify our social world; since they reduce the amount of processing (i.e. thinking) we have to do when we meet a new person. By stereotyping we infer that a person has a whole range of characteristics and abilities that we assume all members of that group have. [24/04/08] If service providers see bad reports in the media about their care setting and level of care they give out then they may take it to heart and think that they are rubbish in their job. This results in a poor wellbeing and as stated above, it then affects how they treat their patients. According to this BBC report - www.bbc.co.uk/health/physical_health/conditions/obesity.shtml 60.8% of adults in the UK are estimated to be overweight. According to the same report experts say that the problem of obesity is rising and in 15 years time it could affect 75% of the population in the UK if something is not done. According to this theory people can get better and improve the effectiveness of their communication and also their interaction skills by adapting to the verbal and non-verbal responses from others. Getting your message across and then accurately interpreting the message that is communicated to you are important aspects to communication. Unit 19: Applied sociological perspectives for health and social care. This is the need for increase professional care provided within sheltered housing and retirements homes. Elderly people need more than just a home and food, they may have specific needs in terms of medical care, day centres, transport and leisure. This can make it the same level of volume as the person they are trying to communicate with. Background noise can also affect a person?s concentration. They could lose track of what they were talking about or the person receiving the message might not get every word and therefore not understand what the person is saying.